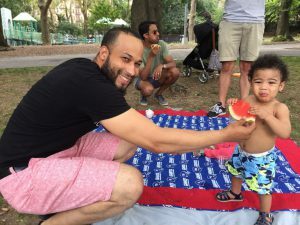 When I first heard about the planned outreach work in Washington Heights, I was interested in doing what I could to help. As the program began to take shape, I volunteered and got involved with The Reading Corner. Through the process of launching the programming and the information sessions, I heard about how the programming was geared toward moms and their children. When I volunteered, however, I saw that there were many dads who were involved and coming with the moms and kids. Over the past year my wife was pregnant and just had our daughter two months ago, and I have come to notice how almost everything that is kid-related is geared toward “mommy, ” but I wish there was more geared toward “daddy.” Since I was looking for more dad-related things for myself, I looked at the people who were attending The Reading Corner and all of the dads who were involved and thought it would be great to provide an event to celebrate the dads. I reached out to Holly and Monika and had the idea to do a cookout with burgers and hot dogs because it’s hard to go wrong with grilled meat. 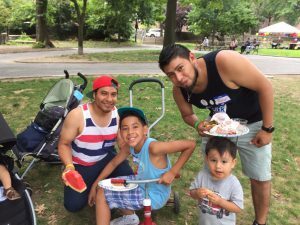 The event came together, and Saturday, July 22nd, a group of dads from El Nido and from the Christ Church Park Avenue congregation got together for Dad’s Day following The Reading Corner. 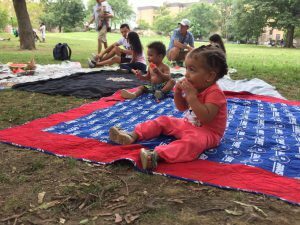 It was a great event, and we had fun eating together, playing with bubbles with our kids and throwing the frisbee around. The event reinforced for me that no matter where you are from or where you live we all want the best for our kids, we enjoy playing with them and like to eat delicious food. I have seen how El Nido has adapted to the needs of the participants and I see the dads’ outreach doing the same thing. In the coming years, I hope that there will be many more opportunities for dads to be involved with El Nido both as participants and volunteers because as a new dad, I can definitely say – the more events for dads the better!